"Having read so much recently about women’s roles in Orthodox Judaism, it was refreshing to read a scholarly woman’s analysis of Orthodox men. 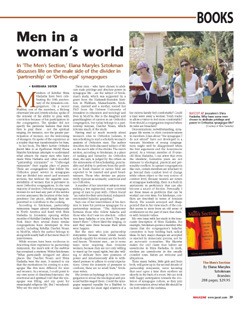 The author describes the little-discussed subject of life on the men’s side of the divider." -- Barbara Sofer, The Jerusalem Post. "It’s a story about tension, identity and dialogue. About living on the borders of a culture, yet still navigating within them. About negotiating, pushing back, and yes, acceptance. Its tale is particular, yet so universal that scholars and laymen all over the world are picking up Elana Sztokman’s new work, The Men's Section." "Perhaps the most important message of the book ...is that until men understand that patriarchy is just as limiting for them as it is for women, little will improve for women." "Fascinting....The Men’s Section is a very interesting and methodical look at a relatively recent phenomenon." "This book is a 'must read' for anyone interested in women's and men's changing roles in Orthodoxy, and will spark many discussions at the Shabbat table and beyond". "This is a superb, well-researched and thoughtful book that investigates how Orthodox Jewish men respond to the new phenomenon of egalitarian religious services." "Sztokman's book gave me a lot to think about vis-à-vis Orthodoxy, as well as vis-à-vis my own sense of gender identity. Reading her book raised fascinating questions for me about what it means to me to be a Jewish woman in the Orthodox community, and the sort of Orthodoxy I like and don't like, and the qualities that I find attractive or expected in men – and why. I highly recommend the book for anyone interested in religious issues or gender issues; the forces at play in partnership synagogues extend far beyond these niche communities, tugging at the definitions of masculinity for men who live in a world populated by women, too." "Feminism is not only about giving women expanded symbolic roles, it’s not just about giving women aliyot, but in changing the entire atmosphere and breaking down the ultimately harmful paradigm of the masculine ideal of what tefillah ought to look like." "The Men's Section offers a thought-provoking...examination of contemporary Orthodox masculinity." "It is a fantastic piece of work. ...I am amazed that we overlooked this important piece of the whole picture for so many years. The book has shaped my thinking from the moment of my reading it forward into the present and future"